Grow your marketing and sales team with a LED window display. Electro-Matic's LED window displays are a simple, affordable and powerful addition to your marketing and sales team. Our intuitive software allow you to customize messages with light, color and motion to grab any audience's attention. 4U2SEE Sunbrite models offer you a choice of blue, green, red, amber or white LEDs that are designed specifically for interior or window locations with more daylight. With over 16 pre-installed fronts, five vibrant colors and 48 transitions modes, our indoor window signs offer stunning visuals that are sure to catch the eye of those passing by. Display your messages in one, two or four lines of text with characters up to 9 inches tall and incorporate timing, transitions and fonts to maximize your impact. Prestore thousands of messages and schedule them to automatically to display with our user-friendly software to save you time and reach specific crowds. Electro-Matic's window LED signs are high-quality, low-cost solution for a large array for indoor messaging applications. This one-time investment allows you to continually communicate in high traffic areas with customized, eye-catching messages. From the convenient power supply options to the user-friendly software, our window LED signs offer everything you would need in an indoor business sign.Easily program your messages on the fly with our remote and wireless capabilites. St. Louis Software Development, LLC was looking for a relable company with high-quality indoor LED signs and the indepth support and service. Electro-Matic Visual Solutions quickly installed an indoor 4U2SEE LED sign that gave them the communication and reliability they needed instore. "It's very obvious 4U2SEE Indoor signs are SOLID. Also I'd like to express my gratitude to the outstanding technical support from Electo-Matic. In comparison, the "other" company took 2 weeks to confirm their sign was buggy. Then another week to deliver a sign update that only provided a quick fix command with no documentation. I'm extremely excited to be working with these 4U2SEE signs as well as you and your company to provide hardware when I need it." By 150% With a New LED Sign! 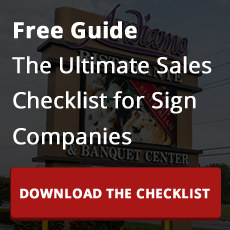 Build your custom sign and take the first steps toward growing your business! "The 4U2SEE Sign I have had for a few years now and it continues to work just fine. I use my personal laptop which uses Vista Home Premium to program the sign and have had no problems with the laptop. I use Microsoft Security Essentials to protect from malware and occasionally use Malwarebytes to do alternative scans for malware. Also, the sign and pocket router are powered through a surge protector. The sign is installed in the bar of our American Legion post and has come to be relied upon as an important communications tool to our members." I cannot express my appreciation of the EMP team we have connected to our account. Your team is eager to respond and to take care of our needs with endless energy and commitment. I cannot begin to tell you how refreshing that is in the current times with the economy the way it is. It’s this continued relationship that makes working with EMP such a pleasure. ~ Jan Pergament, Perceptron Inc.